At the recent Ohio Reptile Research Conference, several of my friends were sharing their early spring amphibian adventures. Their stories of calling frogs and migrating salamanders made me long for life in rural Ohio. And then I got to thinking- although there aren't many breeding amphibian populations in my native Franklin County, perhaps I could find could places to see and here spring breeding amphibians in Alum Creek State Park, just five miles or so north of our home. Alum Creek surrounds a large reservoir, and there are plenty of low lying flat woods around it. Last Saturday, I started on my quest, and sure enough, it wasn't long before I found several large and publicly accessible pools capable of supporting breeding amphibian populations. Since I was doing this in the day, I didn't see all that many things, but I heard several calling spring peepers and chorus frogs, and even one wood frog. After a great deal of searching, I managed to spot this male frog calling from a perch on a dead branch. After I came too close, the frog jumped into the water but resurfaced quickly, allowing for a quick photographic opportunity. For more about the amphibians of Ohio, visit www.ohioamphibians.com, a resource coordinated by Greg Lipps and Jeff Davis. 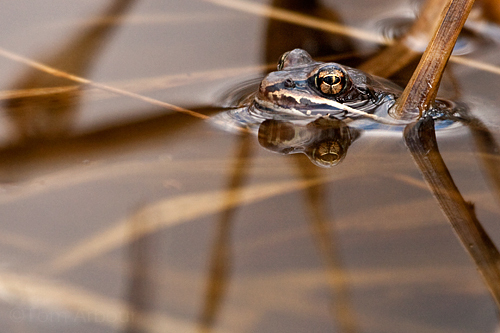 That is a really great shot.I find frogs disappear when I get close enough to photograph them. Very nice photo! I moved to NE Ohio about 1.5 years ago, and I've been pleased to see how many local parks have healthy populations of wood frogs and other temporary pool dwelling amphibians.